The circadian rhythm (CR) is a set of autonomous endogenous oscillators. Exposure to the 24-hour day-night cycle synchronizes our CR system, maintaining homeostasis and human health. 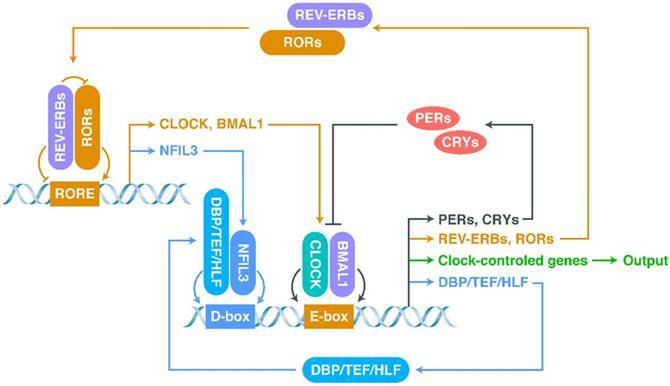 Several mechanisms for the CR system have been proposed, including those underlying the function (transcriptional-translational negative-feedback loops, or TTFLs), mechanisms regulating the TTFLs, and the mechanism by which the “server clock” is synchronized to environmental time. Several pathways downstream of the “server clock” perform well-characterized biological functions. However, the synchronization between the “server clock” (the endogenous master clock seated in the suprachiasmatic nucleus within the hypothalamus) and the “client clock” (imbedded in nearly every cell in the form of interlocking TTFLs) is difficult to explain with current theories. Extracellular vesicles (EVs), which are involved in intercellular communication and have recently been found to participate in regulation of the “client clock”, might be the answer to this question. In this review, we summarize the current knowledge of CRs, TTFLs, and EVs, examine research findings about the functions of EVs in the CR system, and discuss the issues requiring attention in future research. Almost every life-form on Earth is exposed to environmental changes over the 24-hour day-night cycle (environmental time), resulting in the evolution of circadian rhythms (CRs) to adapt to daily changes . A wide variety of physiological processes are influenced by CRs, which are essential for maintaining the health of mammals, including humans . In addition to the sleep-wake cycle—the most conspicuous output of CRs—there are diurnal variations in other physiological systems, including the cardiovascular system, digestive system, endocrine system, body temperature regulation, metabolism, and immune functions [3-7]. The molecular-level core of the CR system consists of oscillating clock-related genes that constitute the transcriptional-translational negative-feedback loops (TTFLs) . Although the oscillators of the CR system are endogenous, exposure to the normal light/dark cycle is essential for the CR system to synchronize with environmental time and keep the body functioning normally by adapting to the environment [9-11]. However, in modern society, sun-free environments in the daytime and the use of artificial light at night have become commonplace, as these technologies have allowed human lifestyles to become increasingly flexible—people can eat, sleep, work, and exercise whenever they want [2, 9-11]. These lifestyle changes correlate with rising rates of several disorders, including heart disease , ulcers , cancer , somnipathy , diabetes , depression , and cognitive disorders . There is solid evidence that night-shift work increases the risk of malignant tumours, diabetes, and cardiomyopathy [19-25]. Thus, a thorough understanding of the operating mechanism of the CR system is essential for disease prevention, early diagnosis, and effective intervention. The endogenous CR system is mainly composed of two parts: the endogenous master clock (or “server clock”) and subordinate clocks (or “client clocks”). The endogenous “server clock” of the CR system is seated in the suprachiasmatic nucleus (SCN) in the hypothalamus [26, 27]. Through specialized retinal ganglion cells, the “server clock” is calibrated by environmental time rather than simply obeying the endogenous rhythms generated by TTFLs [28, 29]. The “client clocks” are imbedded in nearly every cell in the form of interlocking TTFLs, which are composed of clock genes that exert their biological effects via target genes (clock-controlled genes) [30, 31]. Hence, understanding of the synchronization mechanisms between “client clock” and “server clock” is crucial for a complete understanding of the CR system. Recently, post-translational modifications (PTMs) and noncoding RNAs (ncRNAs) have been found to regulate the physiological processes of CRs [2, 32-35]. In addition, extracellular vesicles (EVs), important intercellular couriers of proteins and ncRNAs, have attracted increasing attention . EVs might carry the synchronization signal to correct the “client clocks” in accordance with the “server clock”. In this review, we will first introduce the molecular mechanism of CRs. Then, we will highlight the current knowledge concerning EVs and the regulatory mechanisms in the CR system. Finally, we will discuss how EV-mediated gene regulation could regulate the CR system. Given their emerging potential in diagnostics and even therapeutics, a thorough understanding of the role of EVs in the CR system could help tackle CR-related diseases. The most basic structure of the CR system is the “client clock”, a cell-autonomous circadian oscillator that exists in all cells, which is composed of clock-related proteins and is described as a network of interlocking TTFLs (Figure 1) [21, 37-40]. The core loop of TTFLs is constituted by both transcriptional activator genes [CLOCK, Brain and muscle Arnt-like protein 1 (BMAL1)] and repressor genes [Period-1 (PER1), PER2, PER3, Cryptochrome-1 (CRY1) and CRY2] . The CLOCK-BMAL1 complex binds to the E-box-containing regulatory elements in repressor genes [41-43]. The working mechanism of the core loop, in brief, is that CLOCK-BMAL1 transactivation activates the transcription of repressor genes (including CRYs and PERs) together with the output genes (clock-controlled genes), and then, after translation, the accumulated CRY and PER proteins interact with each other to suppress CLOCK-BMAL1 activation (negative feedback) . As the repression progresses, the protein levels of repressors, which have short half-lives and can be degraded by proteasomes, decrease, allowing a new CR cycle to begin [33, 44]. The network of interlocking TTFLs. In addition to the core loop, there are two sub-loops, which are coupled to the core loop to consummate the oscillation. The first sub-loop consists of retinoic acid receptor-related orphan receptors (RORs) and nuclear receptors called REV-ERBs (including REV-ERBα and REV-ERBβ) [21, 38, 39, 45-47]. REV-ERBs compete with RORs for binding to ROR-binding elements (RORE): REV-ERBs repress, whereas RORs activate, CLOCK and BMAL1 [39, 45]. The second sub-loop consists of D-box-related proteins, including D‐box binding protein (DBP), thyrotroph embryonic factor (TEF), and hepatic leukaemia factor (HLF) [39, 48, 49]. These proteins interact with nuclear factor interleukin-3-regulated protein (NFIL3), a downstream protein of RORs/REV-ERBs, at D-boxes [39, 48, 49]. This molecular-level oscillator network is the foundation of the CR system. The “server clock” seated in the SCN is the master of the CR system in mammals —it receives the input signal (light from the external environment) via the retinohypothalamic tract to synchronize the “server clock” to environmental time . The “server clock” then communicates with the wider central nervous system (CNS) and non-CNS organs . Ablation of the SCN leads to dysregulation of clock genes in the “client clock” of most tissues, causing arhythmicity of behaviours and physiological functions . Thus, the duty of the “server clock” is to synchronize the “client clock” to environmental time . There are three classical neuroendocrine pathways governing the peripheral effects induced by the “server clock”. First, the “server clock” induces the release of epinephrine/norepinephrine via the nerve endings of the autonomic nervous system . Second, it induces the release of glucocorticoids by the adrenal gland via the hypothalamic-pituitary-adrenal axis . Third, it induces melatonin release by activating the pineal gland . These neuroendocrine pathways and their downstream effects can explain many of the peripheral functions of the “server clock” . However, these pathways cannot explain how the “client clocks” synchronize with the “server clock”. There is mounting evidence that disruption of the CR system is intimately implicated in the pathology of neurodegenerative diseases [57-59], metabolic disorders , chronic inflammatory diseases , cardiovascular disease , and malignant tumours . The peripheral blood cells of Parkinson's disease patients have abnormal clock gene expression [63, 64]. Kim et al. found that deletion of the secretory vesicle proteins IA-2 and IA-2β, which have also recently been found to be closely related to EV secretion, affects the CR system [65, 66]. These findings suggest that the pathogenesis of CR-related diseases is complicated and multi-dimensional (at the level of the “server clock”, the “client clock”, or in the signal transduction between them, for example). Recent research has been focused on the multi-level regulatory mechanisms of TTFLs, which can be classified into groups depending on their main level of action: PTMs and ncRNAs. Both the “server clock” and the “client clock” are precisely regulated by PTMs [33-35]. Both the total level and the phosphorylated level of PER proteins dramatically influence the oscillations of the CR system [38, 67]. The main modification of PERs are shown in Figure 2A. In most cases, PER1-3 are phosphorylated by casein kinase I (CKI) and then poly-ubiquitinated by the Skp-Cullin-F-box (SCF) complex containing the F-box type E3 ligase β-TrCP1 or β-TrCP2, before degradation by the proteasome [38, 68, 69]. PER2 is phosphorylated at Ser53 by CKII and then degraded . However, the different phosphorylation sites on PER2 seem to have different effects on the stability of PER2 and thus on oscillations. Phosphorylation of Ser662 (and the four downstream serines Ser665, Ser668, Ser671, and Ser674) leads to the stabilization of PER2 (Figure 2D) [38, 70, 71]. The opposite of phosphorylation is de-phosphorylation. Phosphoprotein phosphatase 1 (PPP1) can de-phosphorylate PERs and thus antagonize the CKI-mediated degradation of PERs [38, 72]. PPP5 regulates the stabilization of PERs and the CR cycle by preventing the auto-phosphorylation of CKI [72, 73]. Moreover, de-ubiquitination and acetylation can also stabilize proteins. For example, BMAL1, PER1, and CRY1-2 can be de-ubiquitinated by ubiquitin-specific protease 2 (USP2), stabilizing them [72, 74, 75]. SIRT1 binds to PER2, inducing its de-acetylation and promoting its degradation [76, 77]. The phosphorylation and ubiquitination of CRY proteins is also important, and a diagram showing the main modification of CRYs is shown in Figure 2B. AMP-activated protein kinase (AMPK) phosphorylates CRY1 at Ser71 to induce the degradation of CRY1 by recruiting FBXL3 . The FBXL3-containing SCF complex induces the ubiquitination of CRY proteins and terminates their transcriptional repression activity by promoting their degradation [79, 80]. Dual-specificity tyrosine-phosphorylation-regulated kinase 1A (DYRK1A) phosphorylates Ser557 on the C-terminus of CRY2 , and glycogen synthase kinase 3 (GSK-3) induces the secondary phosphorylation of CRY2 at Ser553 [81, 82]. After this two-step phosphorylation, CRY2 is degraded by an unknown E3 ligase . 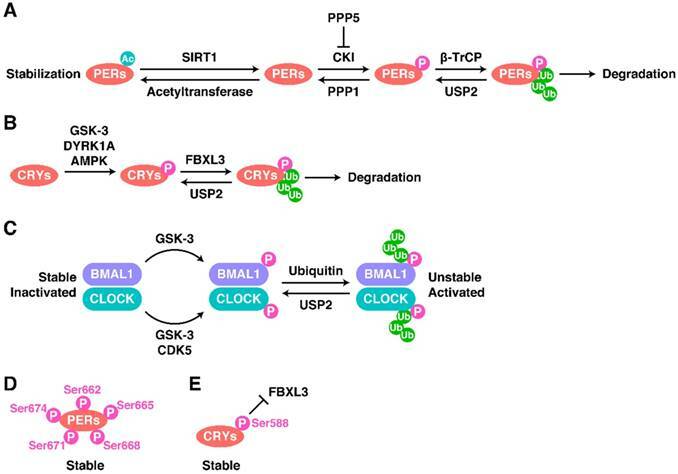 The phosphorylation of CRY1 at Ser588 blocks the interaction between FBXL3 and CRY1, stabilizing CRY1 (Figure 2E), but the responsible kinase remains unknown . Regulatory Mechanisms of the TTFLs. The modification of (A) PERs, (B) CRYs and (C) BMAL1-CLOCK as well as some special cases (D and E). The mechanisms regulating CLOCK and BMAL1 act in a completely different way to those just described (Figure 2C). First, the total protein levels of CLOCK and BMAL1 are relatively stable, but their phosphorylation levels are circadian [67, 84]. Phosphorylation decreases the stability of CLOCK and BMAL1 but promotes their activity [85, 86]. Cyclin-dependent kinase 5 (CDK5) phosphorylates CLOCK at Thr451 and Thr461 . GSK-3 phosphorylates CLOCK at Ser427 and BMAL1 at Ser17 [85, 86]. Noncoding RNAs are also involved in the regulation of the CR system. Researchers have developed a computational model involving PERs, CRYs, CLOCK, BMAL1, and two microRNAs (miRNAs; miR-219 and miR-132) [88-90]. Using this model, it was found that the most studied CR-related miRNAs to date, miR-219 and miR-132, can activate the translation of PER1 and regulate the mammalian CR system [88, 89, 91, 92]. MiR-219 in the SCN shows a rhythmicity correlated to the CR and has its peak expression level at midday [88, 93]. Photo-activated expression of miR-132 requires CREB and MAPK/ERK [88, 94, 95]. In addition, circulating miR-494 and miR-142-3p can modulate CRs by targeting the clock gene BMAL1 [96, 97], while miR-433 regulates the expression of PER2 and BMAL1 . BMAL1 is also targeted by miR-27b-3p  and miR-155 , while PER1 is targeted by miR-34a , and the miR-192/194 cluster can inhibit the PER family . Finally, translation of CRY1 is regulated by miR-185 . The lncRNA TUG-1 is required for photoreceptor differentiation, but the underlying mechanism is still unknown [88, 103]. The level of the lncRNA HULC is positively correlated with the expression level of CLOCK and can upregulate its downstream output genes . However, it is essential to screen more potential CR-related ncRNAs, and study their mechanisms and functions in order to broaden understanding of the regulatory network of CR. EV secretion was initially regarded as a process to eliminate unwanted compounds from cells [105, 106]. However, pioneers in the field (Raposo et al.) found, in 1996, that EVs play important roles in immune responses . Since then, the functions of EVs in intercellular communication have drawn increasing attention and the number of annual citations has dramatically increased, from 28 in 1996 to 24,765 in 2016 . Almost all eukaryotic cells take up and secrete EVs, and these minute EVs contain genetic instructions (nucleic acids and proteins) that regulate the function of the recipient cells, whether under normal or pathological conditions, sometimes mildly, sometimes strongly . Moreover, the communication process mediated by EVs is conserved from bacteria to plants and animals [109, 110]. Most interestingly, there is much evidence of cross-species communication via EVs, even between micro-organisms and mammals . EVs can be roughly classified into three categories: exosomes (EXOs), microvesicles (MVs), and apoptotic bodies (ABs) [106, 112-114]. EXOs and MVs are the most important EVs in intercellular communication, while ABs are rapidly eliminated by immune cells . EXOs (also known as inward-budding vesicles; 30-100 nm in diameter) are generated on endosomal membranes by inward budding during the maturation process of multi-vesicular bodies (MVBs) [105, 106, 116, 117]. Before MVBs fuse with the plasma membrane and release EXOs, EXOs in MVBs are called intra-luminal vesicles [106, 116, 117]. MVs (also known as outward-budding vesicles; 50-1,000 nm in diameter) are generated and released on the plasma membrane by outward budding [106, 113] and were initially studied for their important roles in blood coagulation [106, 118, 119]. However, new research suggests MVs are important players in intercellular communication [106, 120]. Potential Participants in CR Synchronization. (A) The constitution of EVs. (B) The cargoes of EVs might be the key of CR synchronization. Although there are differences between MVs and EXOs in terms of their biogenesis and release, most research on the biological function of EVs has not strictly accounted for the differences in their intracellular origins. Many researchers do not strictly consider small EVs, isolated by gradient centrifugation or 0.22 μm filters, as EXOs [121, 122]. The mainstream view now holds that there is no need to make a detailed distinction between EXOs and MVs, if the research is focused on their pathological and physiological functions, rather than their biogenesis. In this review, we have called them both EVs, in accord with most reviews discussing EVs [123, 124]. EVs contain and transport several types of molecules, including membrane proteins and cytosolic proteins, messenger RNAs, and ncRNAs (such as miRNAs, lncRNAs, and circular RNAs) (Figure 3A) [113, 115, 125]. The regulatory functions of EVs in signalling pathways of recipient cells are based on either receptor-ligand interactions or direct content delivery after internalization [115, 123]. Their phospholipid bilayers enable EVs to protect their cargo from the external environment, and they are found in almost all body fluids [124, 126, 127]. The different surface proteins expressed on EVs give them different targeting properties . EVs can be derived from nearly every type of cell, both normal [129, 130] and malignant [131, 132]. Normal cells use EVs to coordinate, communicate, and cooperate with their “colleagues” . Malignant cells use EVs to mislead normal cells and issue aberrant orders. EVs derived from malignant cells can deliver signals to establish a pre-metastatic niche, a suitable environment for metastasis [133-136]. The constitution of EVs derived from malignant cells is markedly different from that of EVs derived from normal cells [137, 138], and this makes them potential biomarkers in liquid biopsies. EVs also show potential as diagnostic markers and progression markers of infectious diseases [139-141]. Hence, it is also possible to choose EVs as potential markers to monitor the functions of the CR and to detect early warning signals related to dysfunction of the internal CR system. EVs are also potential therapeutic tools to regulate and maintain the internal CR system and prevent/treat disease caused by dysfunction of the internal CR system. Stem cells once showed great potential in regenerative medicine because of their unparalleled proliferation/differentiation potential . However, embryonic stem cells and induced pluripotent stem (iPS) cells have shown key weaknesses, including immunological rejection, tumour formation, and circulation damage [124, 143]. In recent years, EVs have become rising stars in the field of regenerative medicine for use in cell-free therapy. Increasing evidence suggests that stem/progenitor cell-derived EVs have therapeutic functions similar to or even better than their parent cells [124, 144]. In addition, EVs are stable and easy to preserve because they can retain bioactivity during lyophilisation and other extreme conditions during handling, owing to the protective effect of their lipid bilayer [124, 145]. Moreover, EVs can cross barriers such as the blood-brain barrier , so the route of administration is relatively easy. Above all, therapeutic use of EVs is safer than direct use of their parent cells because of their hypoallergenic nature and lack of oncogenic potential . Evidence of their hypoallergenicity includes the fact that human-derived EVs work well upon first injection and repeated injections in animal models, including rats, mice, and pigs . Adamiak et al. found that over half of the mice they injected with iPS cells developed teratomas, whereas mice injected with EVs derived from iPS cells (even from the same cells that had caused teratomas) did not develop teratomas . Stem/progenitor cell-derived EVs (or even EVs derived from fragments of cytoplasm such as platelets) regulate the biological processes of the target cells by delivering parent cell-originated nucleic acids and proteins [124, 126, 146-148]. Natural EVs cannot always meet therapeutic needs, and developing improved/modified EVs will be an exciting area of future research [124, 126, 127, 149, 150]. For example, EVs derived from synovial mesenchymal stem cells enhance the proliferation and migration of chondrocytes, but reduce the formation of extracellular matrix . This problem can be solved by enhancing the levels of miR-140-5p in these EVs . Modified or optimized EVs might therefore be the future of EV-based therapeutic medicine. With advances in deep knowledge of the CR system and of the technology of EV-based therapy, preventing or reversing malfunctions, caused by modern life such as night shift work and jet lag, will become a reality. Recent research has suggested that EVs act as a bridge between the “server clock” and “client clock” (Figure 3B). Khalyfa et al. employed a mouse model of chronic nocturnal shift work and found altered intestinal flora and increased colonic cell permeability accompanied by changes in the components of plasma EVs, including clock genes . SIRT1, which is involved in the regulation of PER acetylation (see previous section), is regulated by EVs [151, 152]. EVs also regulate the phosphorylation of GSK-3 , which plays an important role in the regulation of CRYs and BMAL1/CLOCK (see previous section). AMPK, which participates in the regulation of CRYs (see previous section), is regulated by EVs and is probably related to ncRNAs in EVs [154-156]. MiR-132, which plays an important role in regulating PERs (see previous section), is enriched in EVs derived from fibrocytes, adipose tissue-derived stem cells, cardiac progenitor cells, neurons, serum, and umbilical cord blood [157-162]. MiR-219, which participates in activating PER1 translation (see the previous section), is enriched in serum-derived EVs . Therefore, although direct links have yet to be shown, these results suggest that EVs in the circulatory system are communicators between the “server clock” and the “client clock”. An online database of EVs, EVpedia (http://student4.postech.ac.kr/evpedia2_xe/xe/), could help to discover the existence of CR-related genes in EVs [164-168]. The database confirmed the existence of PER2, PER3, CKI families, AMPKβ, AMPKγ, GSK-3α, and GSK-3β, as well as miR-219a, miR-219b, miR-132, miR-494, miR-142, miR-433, miR-27b-3p, miR-192, and miR-194 in EVs. Thus, EVs contain enough bioactive molecules to regulate the “client clock” of recipient cells, so it is essential to verify whether EVs participate in liaising between the “server clock” and the “client clock”. It is important not only to detect any additional CR-related molecules carried by EVs but also to verify the idiographic functions of these molecules. Shende et al. found that several circulating miRNAs (miR-152, miR-494, and miR-142-3p) correlate with diurnal oscillation (expression peaks near midday and 8/12 h later) and participate in the regulation of clock genes in a mouse model . However, this study did not distinguish whether these miRNAs were free in the plasma or packaged in EVs. Circulating miR-494 and miR-142-3p can regulate CRs by targeting the clock gene BMAL1 , but the locations of these miRNAs were not confirmed. In blood, there are two major forms of circulating miRNAs: miRNAs as “cargos” of EVs (miRNA-EVs) and miRNAs bound to Argonaute (AGO) proteins (miRNA-AGOs) . It is generally believed that miRNA-AGOs cannot be internalized by recipient cells because of their size and lack of bioactivity for penetration [169-171], but miRNA-EVs can be efficiently internalized with their miRNAs by recipient cells via penetration [170, 172]. When viewed from this perspective, the circulating miRNAs that regulate CR-related functions stand a good chance of being carried in EVs. Nonetheless, it is important to evaluate not only the total content of genetic material in plasma but also their specific locations (whether enclosed in EVs or not). Potential approach for the release of EVs from the “server clock”. (A) Release into the blood. (B) Transportation from neuron to neuron through the synapse. As outlined above, the mechanism underlying the CR appears to be a complicated, interconnected, and multi-level system. Although the fundamental structure and some regulatory mechanisms have been identified, many questions remain. In particular, current knowledge cannot explain the specific synchronization methods between “server clock” and “client clock”. Before reaching full understanding of the synchronization methods, the regulation of TTFLs at the molecular level needs to be better understood. In this review, we have summarized current understanding of the regulation of TTFLs, including by PTM and ncRNAs, in mammals. 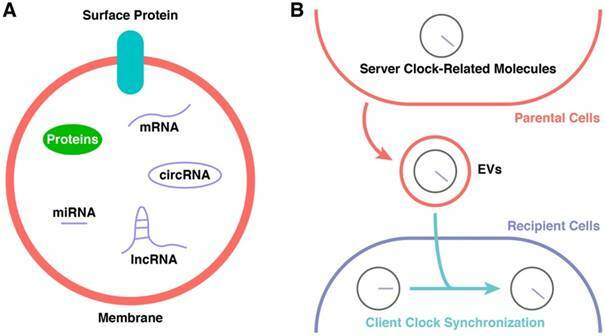 It is possible that the “server clock” transports PTM-related molecules or ncRNAs to the “client clock” through some as-yet unidentified mechanism, which may be EVs. In addition to the transport of EVs in blood, the transmission of EVs between neurons is also worthy of serious attention  (Figure 4). 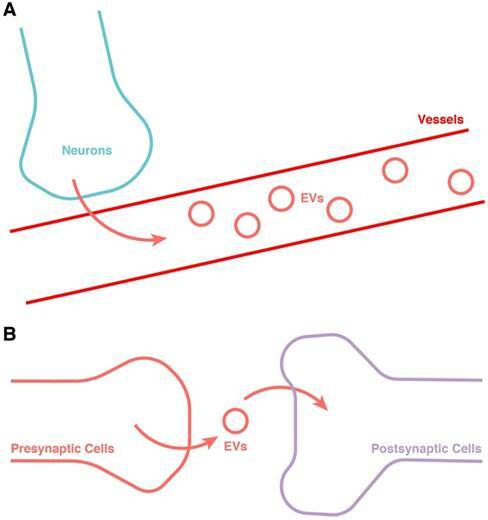 The release of EVs has been found to be dependent on synaptic activity , and could be an important intermediary in neuron-neuron communication [175, 176]. In the larvae of Drosophila, EVs have also been found to be involved in controlling the retrograde postsynaptic signal . The function of EVs related to synaptic activity could be explained by the function of EV-containing cargos including miRNAs and synaptic-associated proteins . This might be not only an important addition to the communication between “server clock” and CNS besides electroneurographic signals, but also a potential jigsaw of the entirety of CR synchronization. Hence, this research area also merits much further attention. Some evidence indicates that EVs participate in the regulation of individual cells' “client clocks”. Circulating RNAs also have important roles in the regulation of “client clocks”. Although the localization of these RNAs is not known, it is well recognized that circulating RNAs with biological effects are mainly found in EVs. It is very important to verify the localization of these circulating RNAs and their specific biological effects in the regulation of “client clocks”. An online database containing a large amount of high-throughput data such as EVpedia can greatly advance the progress of research. However, it will be necessary to establish an online database of the CR system, and carry out multi-database joint analysis to bring a breakthrough in this research area. The National Natural Science Foundation of China [Nos. 81871834, 81802226 and 81301589] supported this work. Shi-Cong Tao planned and wrote this manuscript. Shang-Chun Guo helped with planning and writing. All authors reviewed the manuscript. 20. Breast cancer on the night shift. Lancet (London, England). 2009; 373: 1054.